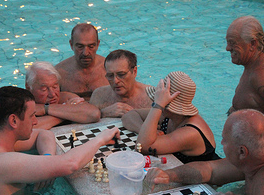 Smoking is not allowed in the whole complex of Szechenyi Baths, Budapest. 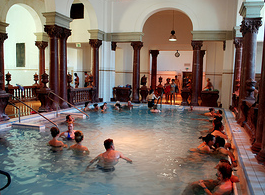 In fact, from Jan 2012, smoking is prohibited in all of the thermal baths, not only in the indoor but also in the outdoor facilities, as thermal baths are considered health institutions, and as such stricter rules regulate the act of smoking. 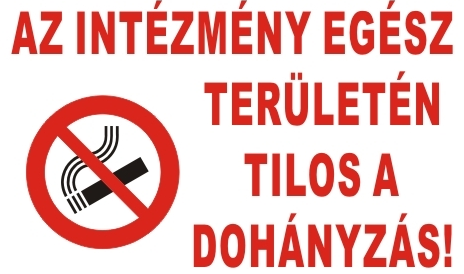 No smoking is ‘Tilos a dohányzás!’ in Hungarian. The notice on the board in the picture says: No smoking in the complete premises of the institute – usually used for baths, schools, hospitals in Budapest. If you are a heavy smoker, you will need to step out of the building of Szechenyi Baths, and smoke your cigarette in the City Park. 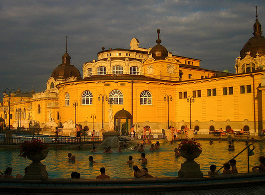 There are cheaper bath tickets to Szechenyi Furdo for a limited bath visit, e.g. 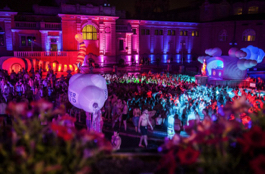 afternoon tickets between 5pm and 7pm. 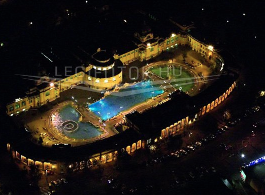 Two hours should be enough to get some taste of Szechenyi Baths: enjoy the spring waters and the fantastic facilities (saunas, relaxing thermal baths, wave pool, plunge pool, outdoor pools, sports swimming pool, massage therapies, etc. ), and not to miss you nicotine dose for too long. Cigarettes in Budapest: what cigarette brands can you buy in Budapest, Hungary? Is it allowed to exit the building and smoke in the park and then reenter? I am afraid, you cannot leave the spa and then re-enter with your ticket, as is it is only valid for one entry. Thank you for your understanding.